When the baby came, you still remember how happy you were, for now, you're a father. 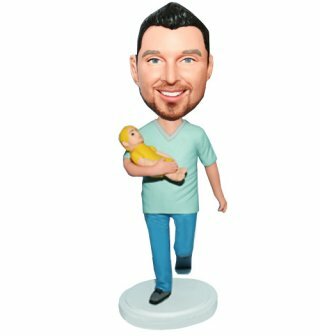 It's so blessed to be a father.it's worthy to grant a bobblehead that the momment you holding your baby. Show how deeply you love the baby now! This customized bobblehead is so ideal a gift for a new daddy who really loves his baby. My figure turned out great. Great communication with the seller. He worked with me until I was satisfied and shipped quickly. Highly recommend!